Among the constants at Italian mainstay Dan Tana’s – and there are many – is chef Neno Mladenovic, who joined the 53-year-old restaurant nearly 30 years ago. And, of course, the menu. Over the course of its storied life, that knowledge has been shared only by those who traveled to West Hollywood to dine and celebrity watch. It is an opportunity that will finally be opened up to an even wider audience after Sonja Perencevic and her daughter Nika Perencevic, who bought the high-end restaurant from original owner Dan Tana in 2008, signed a deal with Prominent Brand + Talent to make Dan Tana’s-branded foods available in U.S. grocery stores and to take the restaurant global. The Perencevics were initially approached about pursuing a brand extension earlier this year by Michael Catalano, co-founder of West Hollywood’s Prominent, housed less than a mile from the restaurant. The expansion comes as restaurants nationwide have struggled to bring in customers over the past couple of years, in part because of a prolonged period of deflated grocery prices, leading an increasing number to leverage their reputations while licensing and distributing their food products. Under these types of deals, a restaurant either signs an agreement for a manufacturer to make and distribute products using its recipe and brand or work with a branding agency to set up such arrangements. Although the margin from licensing a restaurant brand for retail products is lower than for restaurant sales, it can benefit from economies of scale without the personnel and seasonality of managing a restaurant. Retail sales of licensed restaurant products increased 1.5 percent to $4.63 billion in 2014 from the year before, according to a 2016 report from industry publication Licensing Letter. Local chains that have moved emphatically into licensing are Playa Vista’s California Pizza Kitchen; Rosemead’s Panda Restaurant Group; and Beverly Hills’ Fog Cutter Capital Group Inc., which owns the Fatburger brand. Selling retail products can also increase awareness of a restaurant’s brand, analysts said. Fog Cutter has found that licensing the Fatburger brand to sell frozen patties at 4,000 Wal-Mart locations gives it a greater reach than the chain’s 100 national franchises, said Chief Executive Andy Wiederhorn. “Licensing is a way to get your product in places where you don’t have restaurants,” Wiederhorn said. Tana opened his namesake restaurant in 1964 after emigrating from the former Yugoslavia. The place became a magnet for celebrities, reportedly welcoming everyone from Elizabeth Taylor to Paris Hilton. He sold the business in 2008 to the Perencevics, Croatian emigres. 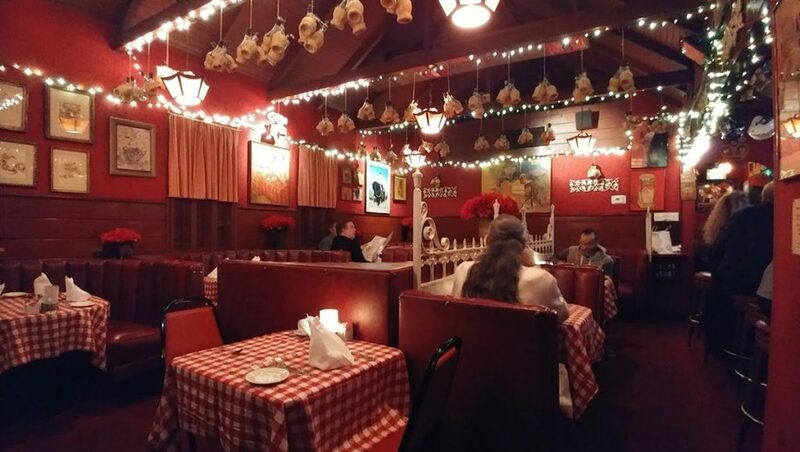 The mother and daughter left the restaurant’s signature red-and-white checkered table cloths and some of the longtime staff in place. It’s that attitude that chef Mladenovic said kept him there for so long. Catalano and his partners at Prominent had Dan Tana’s at the top of their list of potential clients to approach. He said he didn’t know how much the restaurant generated in revenue, adding that the number didn’t determine how much the license might fetch in a different location. Catalano declined to share the particulars of the contract. Licensing agreements differ based on how much work the branding agency does, but the agency usually takes a cut of a licensor’s sales, said Fog Cutter’s Wiederhorn. When Prominent began working with the Perencevics, Dan Tana’s was already selling its marinara sauce at several local Bristol Farms locations, Catalano said. His goal is to extend the reach of the sauce, as well as add olive oil, wine, pasta, vinegar, and fresh and frozen foods to the product line. Terry Italia, co-founder of San Juan Capistrano food brand licensing agency Greystar Products Inc., is familiar with Dan Tana’s marinara sauce. Its short ingredient list would appeal to customers, said Italia, who helped develop and sell branded sauces for Panda Express and Tony Roma’s. But he questioned how well the brand would be recognized outside of the region, and said the price per jar of $9.99 is too high, especially in a category such as pasta sauce that is dominated by big brands including Campbell Soup Co.’s Prego and Mizkan Group’s Ragu. Mizkan paid Unilever $2.15 billion in 2014 for the Ragu and Bertolli brands, which at the time generated more than $600 million in combined annual sales. Jeff Lotman, chief executive of Santa Monica branding agency Global Icons, also questioned the brand’s visibility outside of the state and thought the sauce’s price wasn’t competitive. However, he pointed to the success of Rao’s, another tomato sauce launched from a single restaurant popular with high-profile individuals. Rao’s Specialty Foods Inc. of New York generated about $21 million in earnings before interest, taxes, depreciation, and amortization on revenue of $65 million last year, according to data from Morgan Stanley cited by the Wall Street Journal. The company’s marinara sauce sells for around $8 a jar and is available in most stores across the country, according to its website. Getting such a product into a grocery store is not simply a matter of sales efforts or relationships – it costs money, too, Italia said. Supermarket chains charge “slotting fees” of $50 a store, or $100 for frozen products, for advantageous product placement. Companies licensing their brand for food products get a 3 percent to 5 percent royalty on retail sales, according to Lotman. Opening more locations, as Rao’s Restaurant Group has done in Hollywood and Las Vegas since Rao’s Specialty Foods began selling the sauce, would help increase Dan Tana’s brand awareness, Lotman said. “There would be more chances of someone saying, ‘I saw the restaurant, I’ll try the sauce,’” he said. While Dan Tana’s and Prominent don’t have plans yet to open U.S. locations, they have been exploring international restaurant sites. Catalano said he was in talks with potential operating partners for restaurants in the United Kingdom and Canada, and is also considering Dubai. Dan Tana’s previous management had been discussing licensing its brand for a Las Vegas restaurant with West Hollywood’s Innovative Dining Group, but that deal fell apart when the business was sold, said Lee Maen, a founding partner at Innovative. Maen, whose group owns BOA Steakhouse and Sushi Roku, and has licensed some of its brands for four restaurants in the United Arab Emirates, thinks Dan Tana’s ability to succeed in foreign markets would depend on the operator. The role that a staff can play in bolstering a restaurant’s reputation is underscored by Mladenovic’s sharing of a story from Dan Tana’s Hollywood past. Translating the language of insiders outside of Hollywood might prove to be the brand’s biggest challenge.